Lead Liaison is genuinely enthused about our ability to offer our customers automated, personalized and measurable multi-channel marketing capabilities. Like you, we were asking ourselves how to send SMS messages with marketing automation. Well, since our Revenue Generation Software™ helps customers deliver marketing automation strategies it’s a no brainer to plug-in the ability to send text messages directly into our platform. In addition to SMS messages, Lead Liaison’s platform can also deliver direct mail, email and voice calls as part of a comprehensive suite of actions. In 23 minutes we beefed up our multi-channel marketing! The nice thing about this setup is that we configured things once and we were done. We were able to use Lead Liaison’s tokens (merge fields) to insert First Name and Mobile Phone Number into the body of the text message, keeping the content dynamic. We modularized the text message and packaged it up into a Webhook. 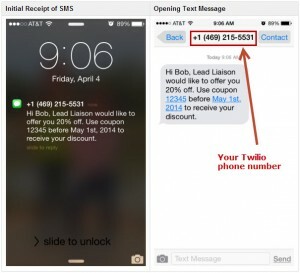 Then we simply dragged/dropped the SMS call to Twilio into our automated workflow. Bam! No more wondering how to send sms messages with marketing automation, it’s here! 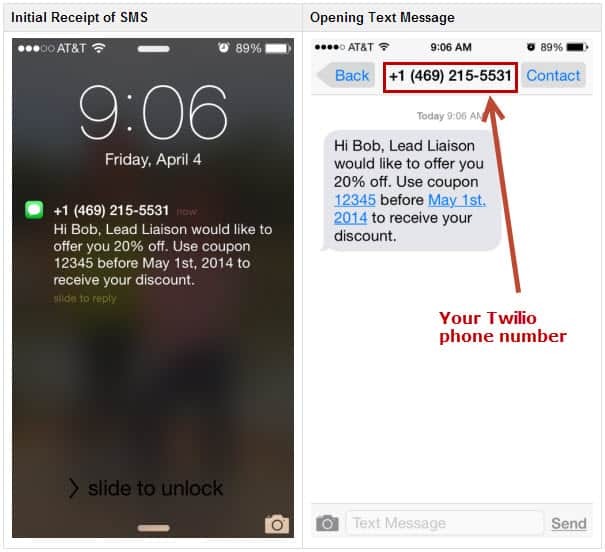 See the image attached to this post to see our SMS message delivered by Twilio.